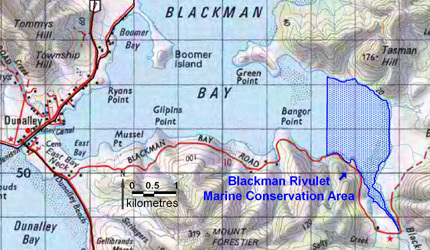 The Blackman Rivulet Marine Conservation Area occupies approximately 263.1 hectares within Blackman Rivulet and Blackman Bay in the north of the Tasman Peninsula. The reserve contains sheltered marine inlet sediment ecosystems and diverse seagrass and algal vegetation. The area features dense seagrass and seaweed beds which include Heterozostera and Ruppia macrophyte types. Seagrass is a relatively rare habitat within the Bruny bioregion and a large proportion of it is located in the Blackman Bay area. Therefore, this reserve is significant for conservation values and as a scientific reference area for seagrass habitats.